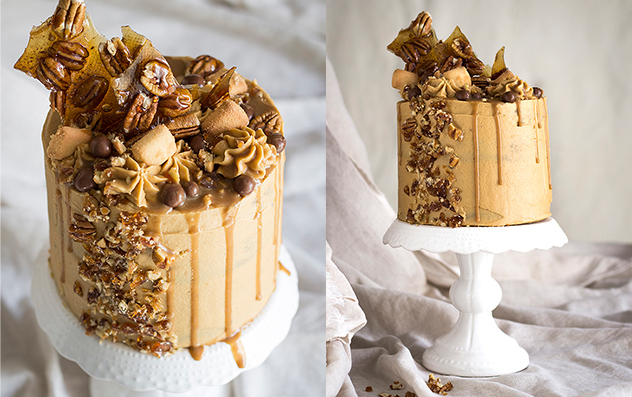 This cake is an ode to my favourite time of the year: autumn. When you eat it, you feel like you’re being wrapped in a warm, knitted jersey. 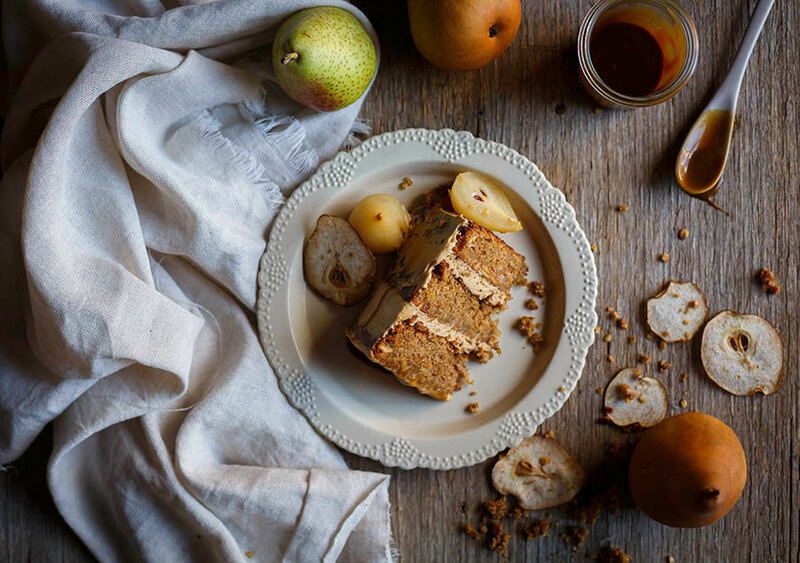 It’s packed with spices, healthy things like sweet potato, pear, sultanas and almonds but my favourite part is the muscovado frosting – I absolutely adore proper, unrefined muscovado sugar – it’s dusky, molasses flavour adds an amazing depth of flavour to this not-too-sweet cake. It’s a little more expensive, but to me, it is worth every penny! 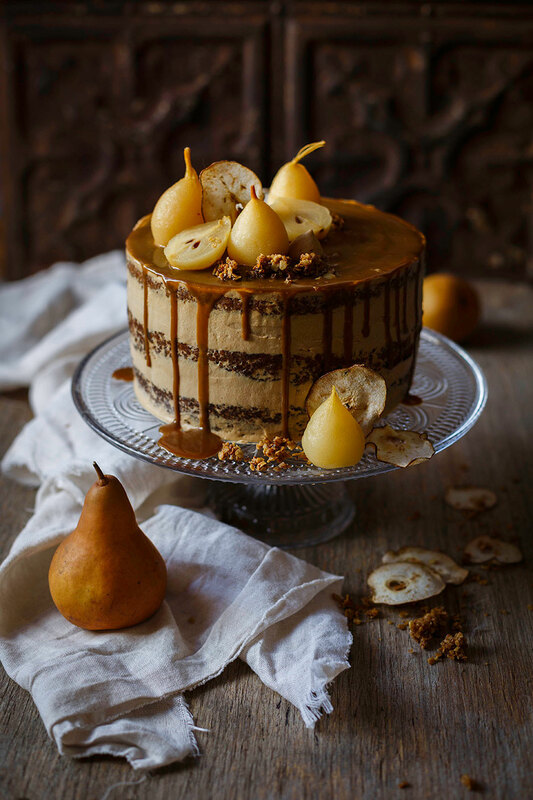 I’ve topped them with wafers of pears which, if you want to make your own, are very easy. 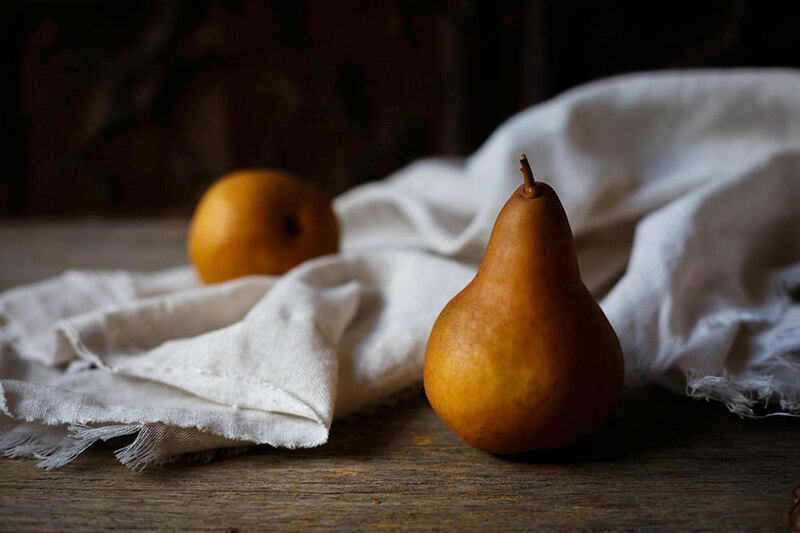 Simply slice the pears very thinly (using a knife or mandlin) then lay them onto a silicone baking mat or baking paper and place them into an oven (with the fan on if you have) at 100 degrees celcius for 1 hour 30 minutes until dried out – they’ll keep in an airtight container for ages. Speaking of pears, please tell me you noticed the mini ones?! ? Look how itsy bitsy they are?! Aren’t they the cutest! You can get them tinned from most supermarkets and let me just say, they can rescue ANY dessert. Serve them warm, in a bowl, with piping hot custard and you have instant dessert – and everyone will be so distracted by their cuteness they’ll forget you didn’t actually DO anything. Sometimes I’m so clever I astound myself, anyway, back to the cake. Make it. And if you want to up the adorable factor, this recipe would make uber-cute cupcakes too! Preheat the oven to 180C and grease and line 3 x 20cm sandwich cake tins. Cream the butter and demerara sugar until very light and fluffy. Add the eggs one at a time, beating well in between each addition. Beat in the sweet potato and vanilla. 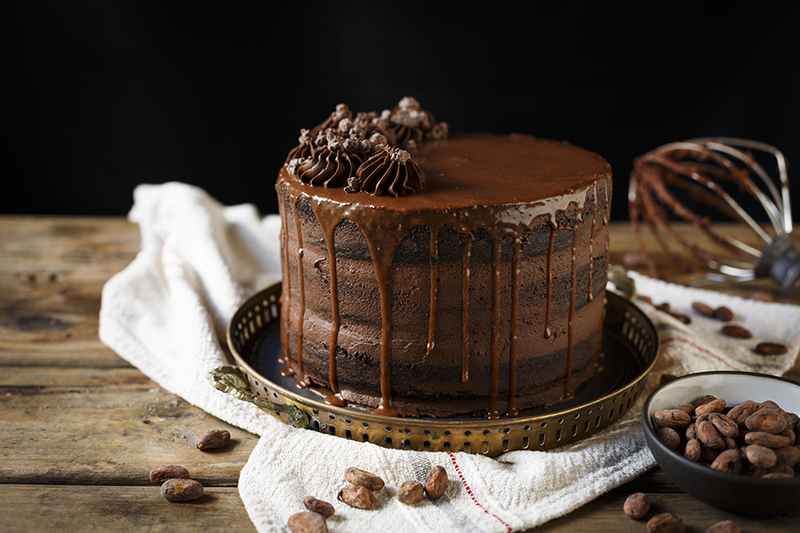 Combine the self-raising flour, bicarbonate of soda and spices and stir into the cake batter. Stir in the grated pear, sultanas and flaked almonds then divide between the 3 tins and bake for about 40 minutes or until a skewer inserted into the middle of the cakes, comes out clean. Allow the cakes to cool, upside down, completely then remove from the tin. 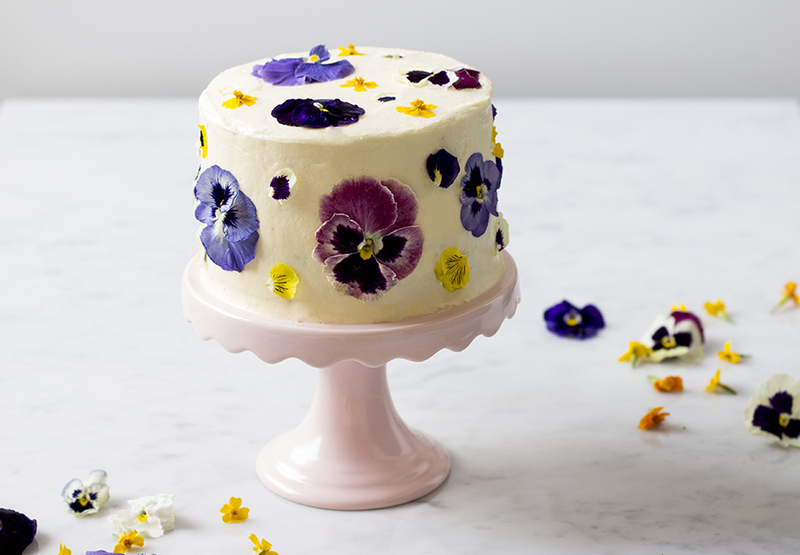 For the frosting, cream the butter until light and fluffy. Pour the boiling water over the muscovado sugar to dissolve (pop in the microwave for a few seconds if needed) then allow to cool. Add the cooled muscovado syrup to the butter with the icing sugar and beat until combined. Mix in the cream cheese. Sandwich the cakes together with the frosting, leaving enough to cover the top. To make the molasses drip, combine all the ingredients in a small saucepan over low heat until melted. Allow to cool to room temperature before using. 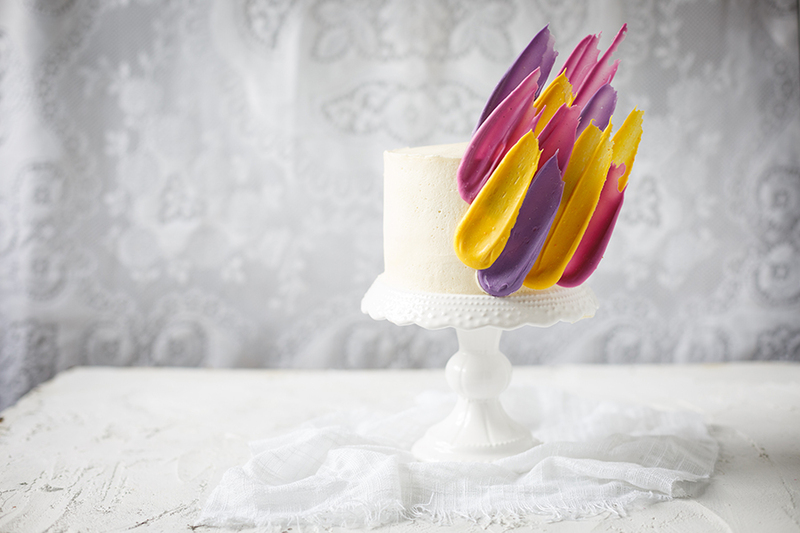 Spread the drip mixture over the cake, allowing it to drip down the sides. 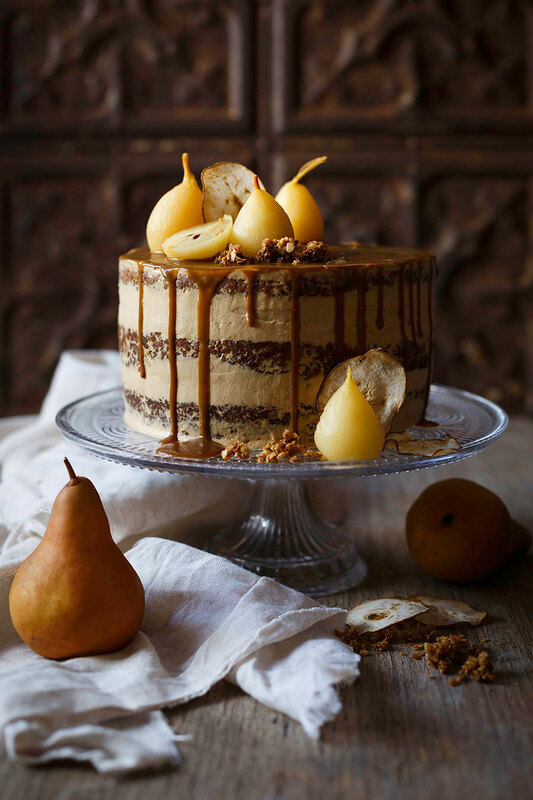 Garnish with tinned baby pears, granola and pear chips.